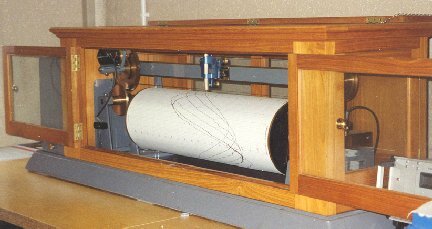 The Munro gauge measures sea level by means of a float in a stilling well. The float is about 45 cm diameter - the large diameter reduces inevitable errors in buoyancy due to friction of the gearing and small changes in the length of float wire. This wire is coiled round a drum on the end of the gauge and another drum contains the counter balance wire. The drum is geared to a slotted tape attached to a pen carriage which travels the chart during the rise and fall of the tide.